Anger Management: 12 Step Guide to Recognize and Control Anger, Develop Emotional Intelligence, and Self Discipline gives you an outline of the 12 most critical steps you should take to manage your anger. 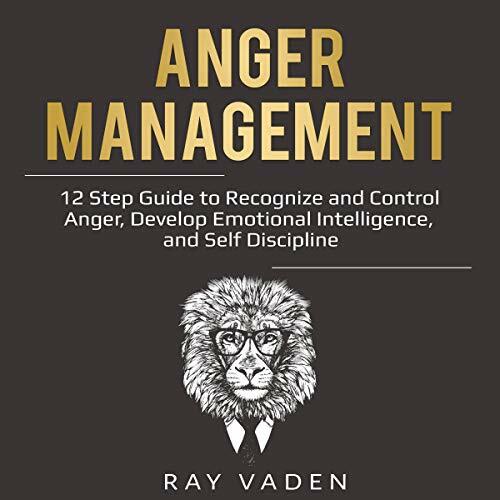 To that end, this audiobook is arranged into 12 brief sections that detail the steps you ought to take in the process of managing anger by recognizing and controlling anger to develop self-discipline and emotional intelligence that you need to maneuver through life and to guide the relationships you form with others. This audiobook begins by indicating to you the need for you to accept your anger rather than suppressing it. It would actually be impossible for you to deal with something of which you have not taken ownership. Once you accept that you are angry, you need to understand the nature of your anger by determining its origins, its triggers, and the signs your body produces to indicate that the anger is about to surface. Once you realize this, you can quickly take control of the situation. The techniques the audiobook offers to deal with your anger once you have understood it include pausing before you react, calmly expressing your anger, practicing empathy, redirecting your focus from the triggers of anger, and how to channel your anger in a creative way. Lastly, you will find a discussion on different strategies you can take to incorporate all these steps into your daily routine. For example, you will see a guide to help you in the process of forgiving and for taking up humor to overcome anger in your life. Therefore, to get started on the process of overcoming anger, get started by purchasing this audiobook today! The activities in the workbook are a great way to see situations that you were involved in from a different perspective. In doing the activities you can have a further understanding of how to approach similar situations better in the future. The Anger Management audio book for Men will give you positive and productive anger management tools to strengthen the most important and most overlooked relationship in your life— your relationship with yourself. Even if anger is not an issue for you, this is still a good activity book to be sure that you manager your overall emotions and feelings in a manner that is helpful to yourself and others. This is a book that really makes you think about yourself and the way that your mind portrays certain situations. It helps to understand the origins of anger in your head and helps to find ways to alleviate the actions that go along with anger. A good audiobook on Anger Management! Thanks to Ray Vaden for providing us an excellent book! Must listening to this! You’ll find practical, workable approaches here to understand and desensitize these triggers. You’ll discover how to live more peacefully, enjoy better relationship security, be more patient with the world, and get more of what you need without the stress or regret of anger and rage. Anger Management offers "no-nonsense" understanding which can be quickly put into practice, helping you to re-connect with your best self! Helpful suggestions. I just wish it was longer, and wish he was nearby, I'd definitely like to become a client. I felt like my irritability and anger were hardwired, so I was afraid nothing could actually help. Most suggestions don't help when you react so fast it gives you whiplash. But this book REALLY helped. I listen it weeks ago and haven't had an anger episode since. I feel much more in control. Ray Vaden is clearly a very kind person. His approach is no-nonsense but understanding and nonjudgmental.